Sea of Tranquility Slots | Collect £1,500 Bonus Cash! Go on an interstellar adventure and play Sea of Tranquility Slots! Enjoy the lucrative Close Enough feature to help you grab extra cash prizes when you Spin to WIN today! Reach for the moon and play Sea of Tranquility slots today! 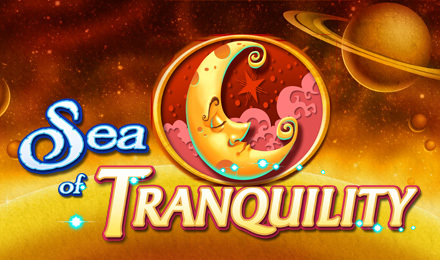 Themed on the Lunar mare found on the moon, this online slot game has beautiful graphics that include a Nightcap, the Moon, Owls, Time Dial, Space Ship en-route, and more! You can win big with the Close Enough feature which allows expanding Wilds and Bonus symbols to count towards a win even when they are outside the payline! The Shooting Star is the Expanding Wild symbol and can complete winning combinations on the reels! Try to get 2 or more Crescent Moon Bonus symbols to trigger a FREE Spins Bonus offering up to 50 Free Spins and a 25x multiplier!